The UK's premier free flying event! The 2019 Lakes Charity Classic will be held on Saturday & Sunday 22/23 June 2019 in Grasmere - based at the Grasmere Sports showground. Registration is now open to all. What is the Lakes Charity Classic? A Competition - This is for more experienced and seasoned pilots holding a minimum of Pilot rating. Any certified wing is permitted; uncertified gliders will not be accepted. Tandems are allowed but with only one named pilot in charge and scoring. B competition - This is most suitable for less experienced pilots who wish to get the most flying from their day in a spectacularly scenic area. Less demanding, friendly tasks will be set and it is open to pilots with Club Pilot and Pilot ratings flying gliders of ENB/DHV1-2 and below. We also offer 2 days of coaching as an alternative. 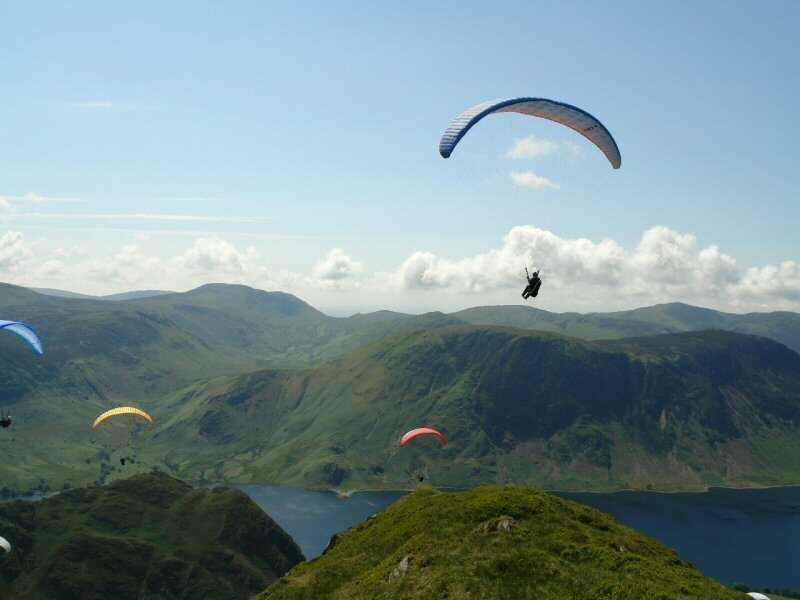 If you don't fancy taking part in a competition but fancy some flying in some of the most spectacular scenery in England, then the coaching event gives you a chance to fly with the coaching team from CSC. The programme starts early on Saturday morning where there will be a briefing before we head off for the flying sites. We aim to get the best out of the day so the tasks will be geared to the conditions. Remember, though, that the Lake District is the wettest place in England. In 2018 we flew on the Saturday and it was blown out on the Saturday; in 2017 we were rained off on the Saturday but flew on the Sunday and we got flying both days in 2016. One thing you can be sure of, is that we'll always do our best and will plan other activities to suit the conditions. This is what it looks like on a good day. The Saturday might be a long day if the conditions are good. 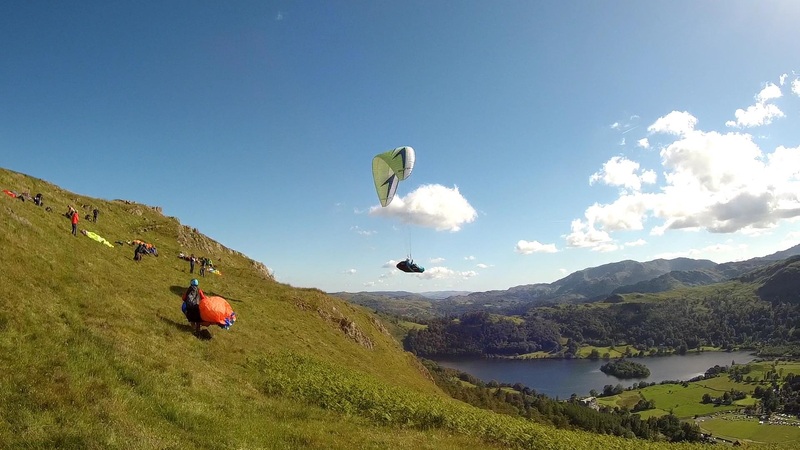 On return to the campsite in Grasmere, competitors may get an opportunity for a fly down to the campsite. An evening meal is provided for competitors. Sunday follows the same format although the day might be shorter. All competitors must have current membership of the BHPA and show their membership card at registration. A competition pilots must fly a certified wing. Un certified wings are not permitted. B competition and coaching competition must fly a rated ENB/DHV1-2 and below. You must carry a suitable correctly fitted EN rated reserve system. A and B competitions will need a GPS which generates a 3D tracklog and can download an igc tracklog to GPS Dump or direct to a Windows based PC. It is your responsibility to ensure that you have a GPS capable of this. Your flight can only be scored with an igc tracklog. We have cables for most common types of GPS but you should bring your own cable. If you have a GPS with a special cable, make sure you bring the cable. It is your personal responsibility to ensure that you are fit to fly and that conditions are not beyond your ability. All flying must be in accordance with the rules of the air and obey airspace restrictions. In addition the direction of turn for 360-ing may be set by the Task Director and must be obeyed while flying in the vicinity of the take off area. It is your responsibility to attend the morning briefings at base and briefings which take place on the hill. Please ensure that you understand all the information given out at these briefings. As well as details of the task, the briefings will relate to your conduct on the hill and in the air. The Task Director will control take-off and landing areas. He will ensure adherence to take off windows, as specified at the task briefing. In addition he may decide not to allow any take-off if, in his opinion, the conditions are unsafe. (The Director’s job is a difficult and thankless one so please accede to his every request with good humour!). All pilots must wear a suitable helmet, rated to EN 966, at any time they are attached to a glider, including ground handling. All equipment used must be in an airworthy condition. It is the duty of every competitor to land and render assistance to any other pilot who appears to be in difficulty on the ground or, if it is deemed unsafe to land, to contact an official or the emergency services at the earliest opportunity. You must complete each day’s score from your GPS as quickly as possible after the end of the task. Any dispute or protest must be filed with the Task Director within one hour of the relevant task results being released. The Task Director’s decision is final. Contact details for the Task Director or nominated deputy will be available. Any competitor flagrantly disobeying any of the above, or who is judged to have flown in a reckless manner endangering other pilots, or who is found to be obviously under the influence of drink or drugs while preparing for flight will be liable to disqualification. Please note that the legal limit for operating an aircraft in the UK is 27 milligrammes of alcohol per 100 millilitres of urine. By way of comparison the limit for driving in the UK is 107 milligrammes of alcohol per 100 millilitres of urine. ALL pilots (not just competitors) landing on the LCC field must land ONLY in the designated landing areas, in a standard manner and as safely as possible. Do not engage in low level swooping over people or marquees. Briefings. The Task Director will endeavour to provide detailed briefings before each task. Please listen carefully as you will be given important information about the task for the day, local safety information and landing agreements. Flying the Lakeland Fells. At this time of year strong conditions can be encountered and caution must be exercised when flying in the mountains. The Task Director is an experienced local pilot who knows these fells. It is well worth listening and acting upon all he/she has to say. Your decision. The decision to fly will always be yours and yours alone. If you are not happy and confident in the prevailing conditions on any day then do not fly just because it is a competition. Flying in company. If you are not a seasoned competition pilot be sure that you are fully conversant with the rules of the air. It may become crowded over launch and it is your responsibility to fly safely and with consideration for others at all times. Note that the B competition is geared towards pilots who have not flown in competitions before. Reserves. To compete in the LCC you must carry a suitably sized reserve system, correctly fitted to your harness, and understand how to use it, it’s limitations and potential dangers. If in doubt seek advice from an experienced packer. Mobile Phones & Radios. It is mandatory that you carry a mobile phone whilst taking part in the competition. Mobiles can be useful in an emergency situation and will be used at the end of each day to ensure you have landed safely. You are required to carry and use a radio capable of operating 135 – 179VHF. The Task Director will advise of safety frequencies. Please keep the allocated frequency clear. Note that mobile phone coverage in the Lake District is poor. Please make sure that you are equipped to be able to walk out of the mountains - a map and compass is recommended. If there are places remaining, you can enter the A competition or the B competition. We will also be running 2 days of coaching for up to 20 participants in 2 groups. For all three events, there is a minimum entry donation which enables us to maximise the amount we can give to charity. There are 5 reserve places available in each competition as we normally get some cancellations. If you want to go on the reserve list, register and pay in the normal way. We will then add you to the reserve list. If you think you are a member of CSC, please make sure that you are still a member of CSC before you make your payment. If you can't log on to the members only section of the website, then your membership has expired. Another clue? If you haven't received the latest copy of SFC, same thing. For all events, it's first come, first served! The A competition has a maximum of 45 participants; the B comp a maximum of 35 participants. The coaching sessions are limited to 20 participants. If after booking, it turns that you can't come, there is no right to a refund of your donation. We are collecting for charity! Competition entry will be closed when the maximum limit has been reached or by 1700 on Wednesday 19 June, whichever is earlier. Your BHPA membership will be checked at registration. If your BHPA membership expires in July, make sure you get a new card from the BHPA. At the very minimum, make sure you get an e-mail from BHPA confirming your membership has been renewed. If you do not have proof of valid BHPA membership, you cannot partake in the LCC and we will not give a refund. You are strongly recommended to carry your BHPA membership at all times - especially members of the coaching group. Please follow these simple guidelines to make sure you get a place at the LCC. Don't send your application form by recorded or special delivery. This involves a long trip to the sorting office if you do and will delay your entry. We need an emergency contact and a contact number for them. Every year we have to tell some applicants that "you" cannot be "your" emergency contact! If it says mandatory on the registration form, it means you need to enter something useful in the box. You should get an e-mail acknowledgment shortly after we receive your application. You can keep an eye on the "participants" section of this page and you should see your name appear - this can take up to a week. If you haven't heard anything within a week of sending off your application then get in touch with the webmaster using the link below. The 2019 Lakes Charity Classic will be held at the same location as 2017 - 2018. The site is the Grasmere Sports showground to the west of the A591 and to the east of Grasmere village. Leave the M6 at junction 36 following the signs for Barrow, Kendal A590 (A591). Take the first junction on the left at the roundabout. Now stay on the dual carriage way ignoring all exits until you come to the Plumgarths roundabout north west of Kendal. Then carry straight on at the roundabout following the A591 for Windermere and Ambleside. Keep on this road through Windermere and Ambleside. In Ambleside follow the signs for A591 Keswick. Speeds start to slow down as you approach Ambleside! 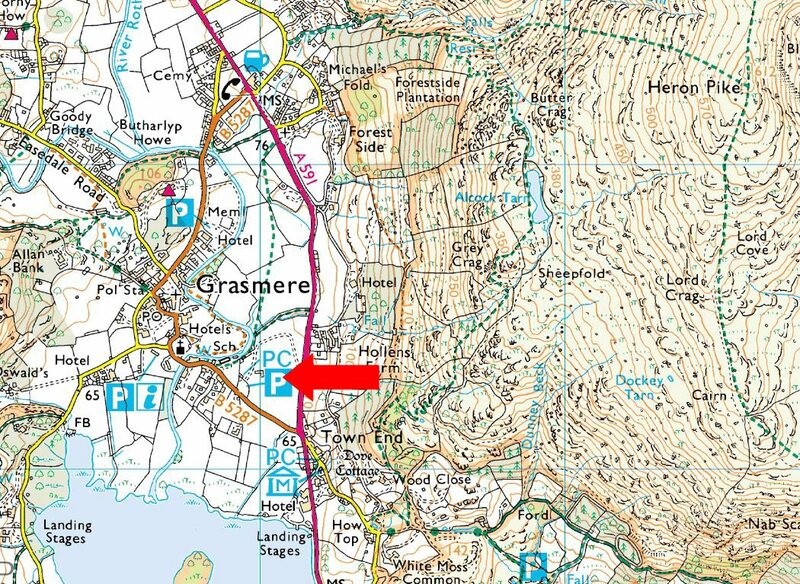 The approach to Greasmere is marked by a sharp right hand bend, a lake (Grasmere) on the left hand side and the Daffodil Hotel and Spa on your left. Carry on to the mini roundabout just after the hotel; turn right at this roundabout. Leave the M6 and junction 40 following the signs for Penrith, Keswick, Brough A66. At the roundabout take the right hand exit - A66 Workington, Keswick. 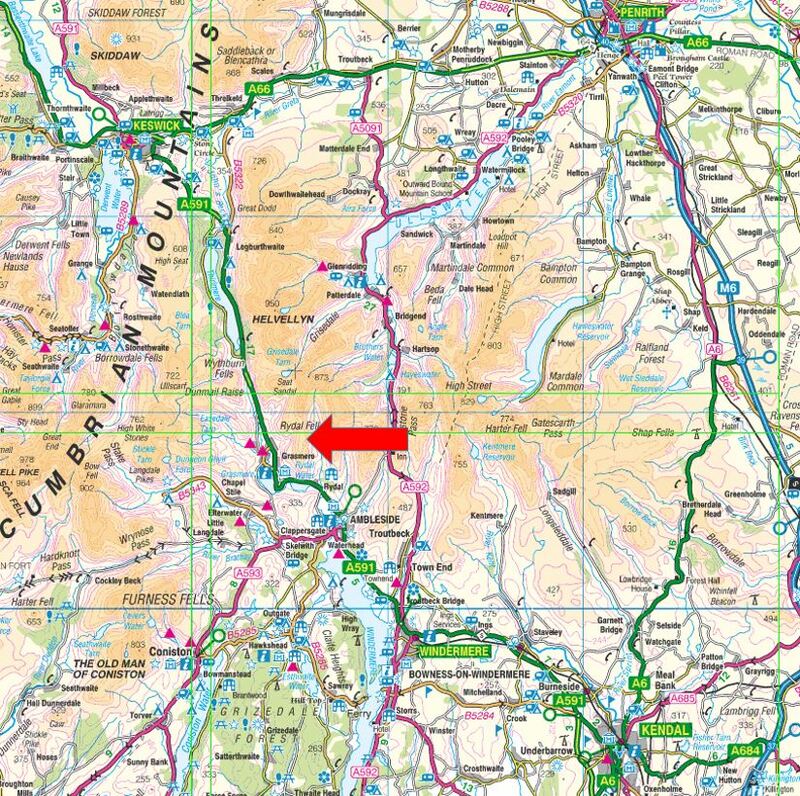 Stay on the A66 to Keswick for around 12 miles and then turn left on the B5322 Thirlmere. Follow this road for 4 miles until you reach a junction with the A591 Keswick/Ambleside road. Turn left and drive south for about 7 miles. This road will take you alongside Thirlmere, over Dunmail Raise and then down into the Grasmere valley. Ignore the first turning on the right and carry on until you see a mini roundabout. Turn right at this roundabout. The entrance to the ground is the first gate on the right. There should be someone waiting to book you in. If the gates are locked, you may have arrived too early. You will need to park in the main car park for the village until we open for business. There is a camping area and a camper van/caravan area. You will be directed to the right area on arrival. There are facilities on the showground - free showers, toilets and water. Camping is on the Grasmere Sports ground. In order to camp at the event you either need to be a competitor or have paid the non competing person fee (£10 per person for the whole weekend). The additional camping fees are £10 per person per night. There is a dedicated area for tents and a separate area for caravans/camper vans. There are free showers on the sports ground. Unfortunately we still cannot get vehicular access onto the (tent) camping field, as the underlying structure (replaced after 2015 floods) will just not take vehicles. The camper van/caravan area may not be the same as 2018, so please wait to be directed to the right place. Electricity Hook up is NOT available this year. Before you consider applying, please read the following terms and conditions. We have tried to keep these to a minimum; the Ts and Cs are to increase safety and ensure everyone enjoys the event. The organisers will not be held liable for any loss, injury or damage sustained at the event, including damage, theft or loss to property or motor vehicles, even if the cause is due to the negligence of a ticket holder, the organisers or the actions of other third parties. There will be CHILDREN on the site. Guardians: be aware of their whereabouts and safety at all times. Drivers & Pilots: please be especially aware! ALL PILOTS (not just competitors): no low flying or swooping over people. Vehicle SPEED LIMIT: 5 mph in all areas. Obey all LCC signs & instructions from event marshals. No music or noisy behaviour after 10pm. No open fires or BBQ’s allowed anywhere in the sports ground..
Whilst a skip is provided for rubbish, we woulkd ask you to take your litter & rubbish with you when you leave. Do not climb or damage trees, fences or walls. The organisers reserve the right to require anyone to leave the venue without explanation or refund. Please bring to the attention of the organisers any spilt fuel or oil ASAP. In accordance with UK law, smoking is not permitted in any enclosed area.